The SAT and the ACT play a huge role in college admissions. According to the National Association of College Admissions Counselors, test scores are one of the top three considerations as admissions committees make their decisions. Nearly 3,000 four-year colleges require students to submit their scores from either the SAT or ACT with their applications. Schools generally do not have a preference for either test, but one may play to your strengths more than the other. Of the 3.5 million students who graduated from high school in 2017, 1.8 million took the SAT and 2.03 million elected to take the ACT. It’s important to understand the structure of both in order to choose the best fit. The SAT consists of two sections: evidence-based reading and math. There is an optional essay, but some colleges may require applicants to take it. Check with your prospective school to learn whether you should register for the SAT with or without the essay. The test was overhauled in March 2016 and emphasizes the importance of visual literacy throughout all sections, integrating graphics throughout. Minus the essay, the entire test is multiple-choice and takes three hours. The essay adds 50 minutes to the overall length of the test. A top score on the SAT is 1600 (you can earn between 200 and 800 on each section). 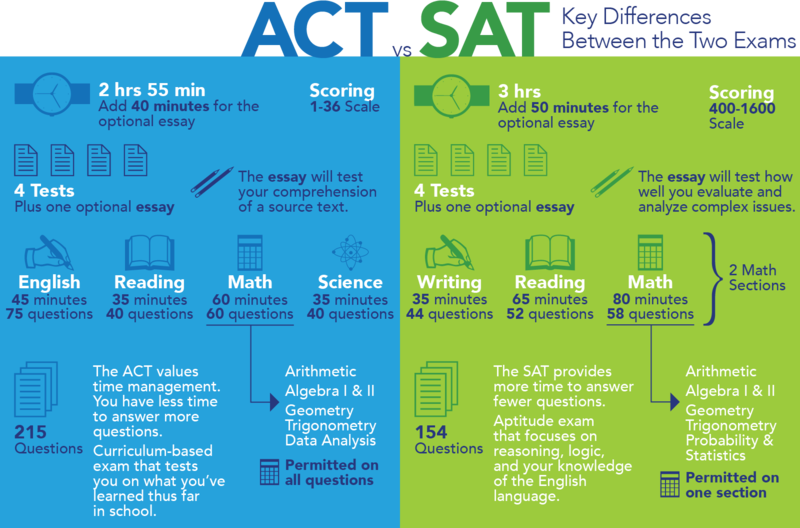 Learn more about the SAT here. The ACT covers more material than is tested by the SAT; instead of two sections, it has four. Like the SAT, reading and math are both covered, but the ACT also tests English and science. There is an optional essay, which may be required by certain colleges. Check with an admissions counselor to determine if you should register for the essay when you register for the ACT. The ACT allows 2 hours 55 minutes to complete the multiple-choice portion of the test, and 40 minutes to complete the optional essay. A top score on the ACT is a 36 (each section receives a score between 1 and 36, which are then averaged together for a composite score). Learn more about the ACT here. How do I decide between the tests? Nowadays, colleges generally do not have an SAT or ACT preference. They simply want to see high scores, and they use concordance tables to understand the relationship between the two tests so that they can be adequately compared. A person who does very well on the SAT may not do so well on the ACT and vice versa. So how do you decide which one is best for you? The structure of questions on both the SAT and the ACT is similar, with the exception of the math sections. On the ACT, all math questions are multiple choice; on the SAT, some questions are multiple choice, while others are “grid-in” and require you to bubble in your own answer. Regardless of test and section, all multiple-choice questions have four answer choices. There is no penalty on either test for incorrect answers. The ACT measures academic achievement in core subjects, with a particular emphasis on math and science that you will not find on the SAT. Math formulas must be memorized; they are not provided to you. You may prefer the ACT if you excel in STEM classes. The content is difficult, but the questions are straightforward. On the other hand, the SAT evaluates your critical reading and reasoning skills. It stresses vocabulary and logic. Math formulas are provided. You may prefer the SAT if language is your strong suit. While you may need to spend time figuring out what a question is asking before proceeding, the general concepts are easier than on the ACT. People will argue that one test is harder than the other, but it all comes down to personal preference and different ways of learning and processing information. If you so choose, you could take both the SAT and the ACT and send your higher score to your prospective institutions. Colleges value the ACT and SAT equally, so choose the one that showcases your strengths. When should I plan to take the SAT or ACT? You should plan on registering for the ACT or the SAT during the spring semester of your junior year, preferably during January or February. This way, you will have plenty of time to receive your scores, study, and retake the test if your scores come back lower than you were hoping. Depending on how you are applying, you can retake the exams up until October (for early admission) or December (for regular admission) of your senior year. Retaking a test allows you the opportunity to up your scores, hopefully making your match schools into your safety schools.